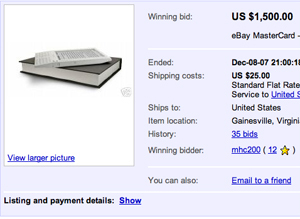 After selling out in just 5.5 hours, prospective Kindle buyers are turning their attention to eBay where the price of an average Kindle is $864.04, that’s more then double the retail price of $399.00, one desperate bidder paid $1500 for theirs! Prices on eBay.com range from $600 to $1500. Dont you wish you had ordered a couple of Kindles on launch day, you could have sold one of them on eBay which would have easily paid for the other one. With the remaining cash you could have downloaded a couple of titles from the Amazon store as-well. Aside from limited availability, buyers from outside the United States are likely driving the Kindle’s price up, as they are not able to buy it directly from Amazon. However, prices will surely fall once more Kindle owners try to make a quick buck selling their device, just as many did with the Apple iPhone over the summer. This entry was posted in Kindle News and tagged $1500, eBay, Kindle, Sold Out by Dzmitry. Bookmark the permalink.